Place yogurt, mascarpone,milk and honey in a bowl and whisk to combine. 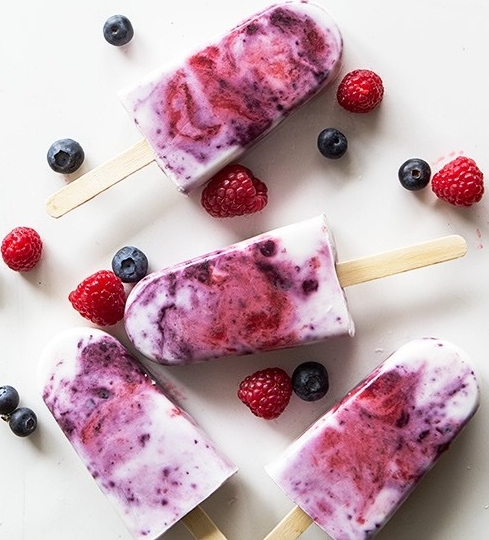 Layer popsicle well with yogurt mixture, strawberry and blueberry puree. Use a fork or knife and drag and swirl the mixture around in the popsicle well (to keep streaky looking, do not over mix). *To make strawberry puree: Blend one cup of strawberry with 1 tablespoon of sugar and water. **To make blueberry puree: Blend ¾ cup cup of blueberries with 1 tablespoon of sugar and water. To shortcut this recipe, sub out the fruit puree with jam.